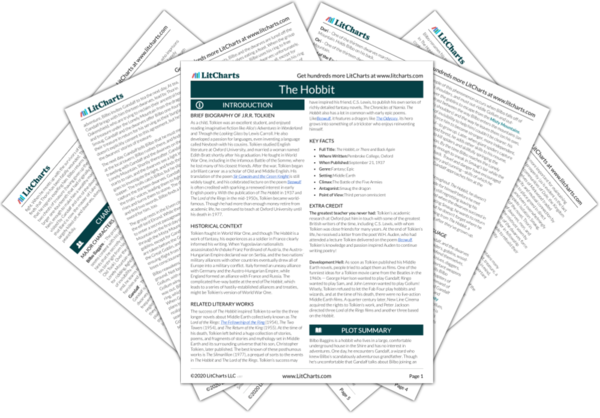 Instant downloads of all 942 LitChart PDFs (including The Hobbit). LitCharts assigns a color and icon to each theme in The Hobbit, which you can use to track the themes throughout the work. Bilbo, who has developed a cold in the water, floats along with the dwarves, still in their barrels. In the distance beyond Lake-town, he sees the Lonely Mountain, the mountain he and the dwarves have been trying to reach, and thinks that he isn’t at all glad to see it. The narrator notes that Bilbo has found the only good path from Mirkwood to the dwarves’ destination—the river—since the roads of Mirkwood have become too dangerous, or fallen into disrepair. Gandalf, having learned this information, makes haste to rejoin the dwarves, though Bilbo doesn’t know this at the time. The narrator offers his own take on Bilbo’s adventures, and explains that Bilbo was luckier than he could have imagined. This suggests that Bilbo’s success as an adventurer—and, perhaps, all adventurers’ success—isn’t entirely up to them; there’s an element of chance or fate at play. Gandalf will return to the dwarves to help them, but it’s clear by now that Bilbo can often figure out how to get by without Gandalf. The narrator notes that Lake-town is a town of men, which, like much of the area surrounding the Lonely Mountain, has fallen into disrepair following the arrival of Smaug. Though men in Lake-town are relatively far away from Smaug, and survive by trading with the elves along the river, they can still see the ruin Smaug caused—there are no trees or elaborate buildings. Some say that one day the dwarves will return to their home, and the men of Lake-town will return to and rebuild Dale, a large town that was prosperous when it traded with the dwarves and that Smaug later destroyed. Tolkien here portrays the importance of hope to the townspeople; they get through their difficult lives by thinking ahead to a brighter future. This reinforces the importance of music and poetry—the songs the dwarves sing at the beginning of The Hobbit, for instance, help to maintain this spirit of hope. The connection of the relative poverty of Lake-town to the disappearance of the dwarves from the Lonely Mountain again suggests the power when elves, men, and dwarves cooperate rather than fight, when they work together rather than split apart based on greed. Long after the sun sets, Bilbo swims to the shore and lets the dwarves out of their barrels; they are extremely tired and hungry. Because he is so wet and exhausted, the narrator notes, it would be some time before Thorin was polite to Bilbo again; nevertheless, he thanks Bilbo for saving them from the elves. The group makes its way into Lake-town, and Thorin announces himself as the King Under the Mountain and demands to be taken to the Master of the town. Thorin is a stubborn, occasionally ungrateful dwarf; this foreshadows the events of the final third of the book. Yet he’s also a noble, impressive figure, who quickly switches from being cold and wet to commanding the respect of the entire town. Men take the dwarves and Bilbo to see the Master of Lake-town, who is at a feast. He is astounded to hear that the King Under the Mountain has returned, and though there is an elf at the feast who says that Thorin and his comrades are escaped prisoners, the general excitement over Thorin’s return is so great that the Master has no choice but to allow the group to remain free. The Master is immediately shown to be a callous, greedy leader, who feasts even when his people are poor and hungry. Despite his greed, he’s not a particularly powerful leader; he has to give in to the crowd because he isn’t strong enough to disagree with them. This suggests that the Master stays in his position by manipulating popular opinion, rather ignoring it altogether. He comes to serve as a contract to other, more heroic characters. 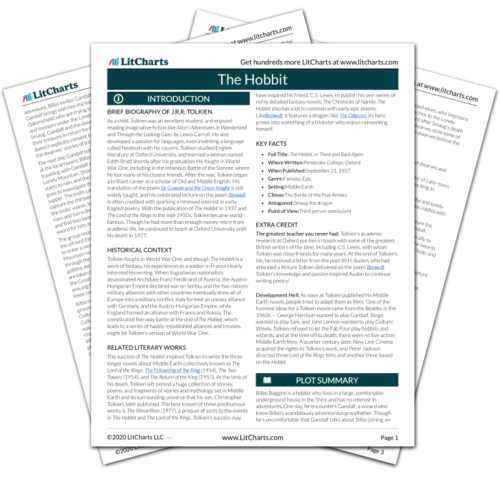 Get the entire The Hobbit LitChart as a printable PDF. For the next two weeks, Bilbo and the dwarves enjoy the town’s hospitality, and regain their strength. After this time, Thorin announces to the Master that he is ready to go to the Mountain. The Master is surprised, because he had assumed that Thorin was a fraud and merely pretending to be the King Under the Mountain in order to get free food and lodgings. Nevertheless, the Master conceals his surprise and wishes Thorin good luck on his quest. He is happy to be rid of the dwarves, since they are expensive to take care of. Bilbo is the only one who’s unhappy to be leaving the town. The Master is such a fraud himself that he’s amazed when his guest turns out to be sincere in his aims. Bilbo, despite the aptitude for adventure he’s developed so far, isn’t at all eager to go to the Lonely Mountain. This raises the question of what, exactly, Bilbo wants to get out of his quest. It may be that Bilbo wants a “healthy balance” of adventure and peace—too much of either one makes him anxious. Arn, Jackson. "The Hobbit Chapter 10: A Warm Welcome." LitCharts. LitCharts LLC, 21 Jul 2015. Web. 21 Apr 2019. Arn, Jackson. "The Hobbit Chapter 10: A Warm Welcome." LitCharts LLC, July 21, 2015. Retrieved April 21, 2019. https://www.litcharts.com/lit/the-hobbit/chapter-10-a-warm-welcome.